Really? 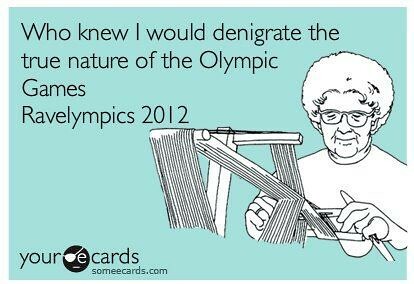 So watching and knitting along with the Olympics somehow denigrates the “true nature” of the Olympics? I’m sorry, but someone hasn’t done their history homework. Knitting was once apart of the Olympics! The backlash about this has gone viral on the internet – on Ravelry (obviously), Twitter (which is being overloaded with hashtags like #ravelympics and #soxforColbert), and its also hit Gawker. All the backlash from the knitting community and viral internet load has poked the USOC to post a statement in response apologizing for “any insult” and asking knitters to (ahem) donate “any handmade items that you would like to create to travel with, and motivate, our team at the 2012 Games.” Are you kidding me!? Insult us, then ask us for free stuff. How about no? Someone in England ended up yarn bombing a pier in London. I’m fairly certain it’s in response to all this nonsense. So what’s a knitter to do? I was already torqued up for the Ravelympicsredacted and had picked out which events I was going to enlist in (sock put and the hat dash, obtaining points for lace longtrack and cable steeplechase respectively, and points for stashdown). I had a plan. And now I have no idea what I’m going to do because I feel that the USOC insulted my craft, which takes hours of diligence, hard work, money, and yes, training of a sort (gotta learn how to do those techniques people!) are not worthy of the USOC. Many knitters are now planning on boycotting the Olympics and boycotting the Olympic sponsors as well (voting with dollars!) There’s even a Facebook event page for this very purpose. This dejected knitter is still on the fence of what to do. More on this later…. You are currently reading Sound the alarm! at When Gaia Smiles.